The Mekong Delta City of Can Tho aims to have all of its 36 communes by 2019 and four districts by 2020 recognised as new-style rural areas. In 2017, the city hopes to have seven more communes and one district meet all the criteria of the new-style rural area building programme. To realise the target, the city has accelerated the implementation of resolutions, plans, and action plans at all levels. The city will earmark its budget while calling for resources from enterprises for new-style rural area building. Effective business models will be expanded while investment in rural area will be encouraged, particularly in labour-intensive sectors, to create jobs, increase incomes and improve living conditions for rural people. Vice Chairman of the municipal People’s Committee Dao Anh Dung said the city wants localities to review new-style rural area building criteria. Those that need investment beyond the capability of the locality will receive assistance from the city. Districts must take drastic measures to ensure its communes complete their targets and improve the quality of the criteria in recognised communes. Community work needs to be promoted to encourage the participation of locals in building new-style rural areas, while conducting training courses for local staff. 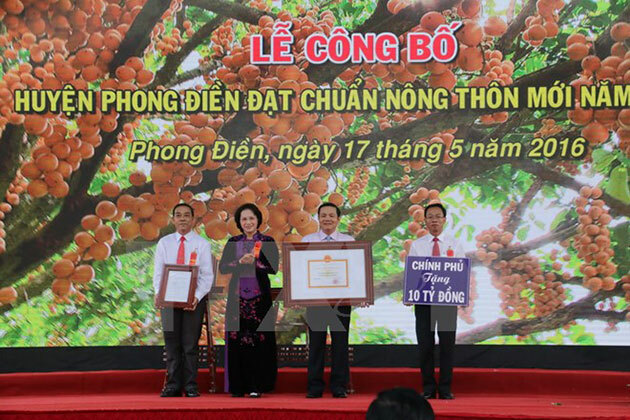 Director of the municipal Department of Agriculture and Rural Development Nguyen Ngoc He underlined the need for restructuring agriculture production to raise incomes for local people. The city encourages numerous large-scale economic cooperation models, such as cooperatives, cooperative groups and farms, with the application of advanced technology. In 2017, the city aims to set up at least four new agricultural cooperatives in four districts while supporting and upgrading operating ones. The agricultural sector will continue implementing projects and plan crop restructuring, large-scale farming, and farmer-enterprise connection to improve efficiency and raise incomes for farmers. To date, Can Tho has 20 out of its 36 communes and one out of four districts recognised as new-style rural areas. These communes have completed at least 14 out of 19 criteria of the new-style rural area building programme. The national programme on building new-style rural areas, initiated by the Government in 2010, includes 19 criteria on socio-economic development, politics and defence, aiming to boost rural areas. The criteria cover infrastructure development, production capacity improvement, environmental protection and cultural value promotion./.